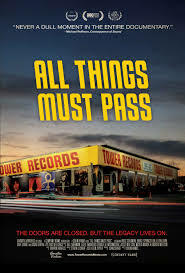 Filmmaker/actor/Hollywood royalty Colin Hanks - staying offscreen for the duration here – shows a gift for nostalgia beyond his young years as he directed ALL THINGS MUST PASS, the chronicle of Tower Records. Remember them? It was a giant music/entertainment retailer and tastemaker that seemed unstoppable until it collapsed, seemingly overnight, at the start of the 21st century. What Hanks does quite well is show how Russ Solomon ended up one of those unsung-hero retailers who steered creative industry choices, as the artists themselves began finding their own muses via the inventory. His LA emporium, in fact, observed special hours to accommodate star shopper Elton John (John is interviewed here, as are Bruce Springsteen and David Grohl). And, while other businessmen were skeptical or hostile, Solomon supported the new digital-CD format, plus other technological advances. Ultimately Tower Records was a worldwide empire. But the advent of MP3 players and shifting demographics led to customers widely abandoning the art of album buying. Moreover, Tower badly overreached in overseas ventures (with the surprise exception of Japan, where an autonomous spinoff of Tower still thrives). By 2004 humiliating layoffs were being inflicted on longtime staff. Hanks finds a convenient villainess via a never-interviewed, bank-appointed hatchet woman, nicknamed `Betty Boop,’ though the fall of Tower (he he, I’m a good writer) might also be ascribed to the tragic leukemia death of an accountant who might have been able to curtail Solomon’s reckless spending. What's remarkable - and sad - is the way Tower vets speak fondly of sheer joy in coming to work, a sentiment rarely expressed anywhere. Nowadays especially. Of course, large amounts of marijuana in the 1970s helped.